Most of the year, I like my steel cut oatmeal for breakfast. It’s comforting, filling, nourishing, and delicious. And muffins are a lovely treat, which I’ve been enjoying the last few months. Sometimes I even pull myself together enough to make waffles or pancakes! Most days, though, I really want something fast and easy (since I’m not very awake at breakfast… Not a morning person.) The hot cereal fits that bill, since I make it ahead of time and heat it back up – but, well – it is hot… And I just really don’t feel like it on mornings when it is already close to 80 at breakfast time. 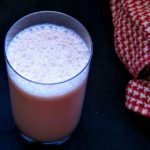 On the other hand, I’ve eaten granola for years… It goes well with yogurt, I can pour a protein shake right over it, it’s crunchy, it’s whole grain – but most of it is incredibly sweet, and I just don’t do that any more. 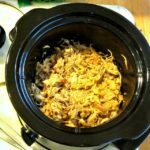 Now – there is actually a reason for that (besides people liking sweet things, that is…) You need something to coat the oats and make them clump together for the characteristic crunch. Classically that something was a combination of oil and honey or some other sugar syrup – and it worked beautifully. But… I don’t do that any more. And I’ve learned that commercial granola all has a lot of sweetener. Even at the natural foods store, even the Sugar Free Granola is full of honey or maple syrup… (and sometimes even just regular sugar! 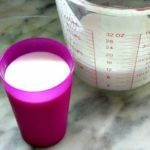 Really – read labels… I actually found that, once… ) So I need to make my own homemade unsweetened granola. And, really – it’s so much less expensive, and I have more control, and I can vary the flavors… homemade granola is totally worthwhile. But, how to get the clump and crunch? I’ve tried several options to hold the grains together, and just didn’t like the way they worked. Coconut milk. Apple sauce. 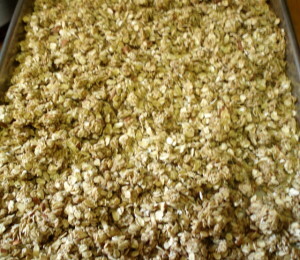 They’re too wet – they soak into the oats, instead of coating them. The oats then baked together like a sort of crunchy cake, which I then broke up, and it was OK, but… not quite right. And so I made them for several years, still wondering what would work better for an unsweetened granola. Then last year, I thought of peanut butter! 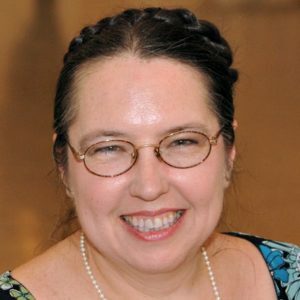 I think it was while I was making a sauce – and I looked at the way it emulsifies and thickens when I heat it with water. So I tried it – and it works well. 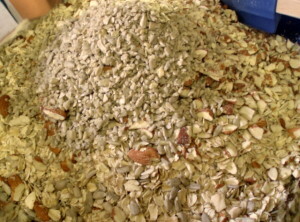 I make a pretty simple mix – mostly rolled oats, some nuts and seeds, sometimes some flavoring. I don’t add dried fruit to my granola because I eat it in summer when I can get fresh fruit – you can use some if you like. (But if you do, addd it later.) You can use other rolled or flaked grains (quinoa, barley…) instead of some of the oats. I’ve added some ground flax seed, different seeds and nuts. I often use either cinnamon or ginger – did not this time. 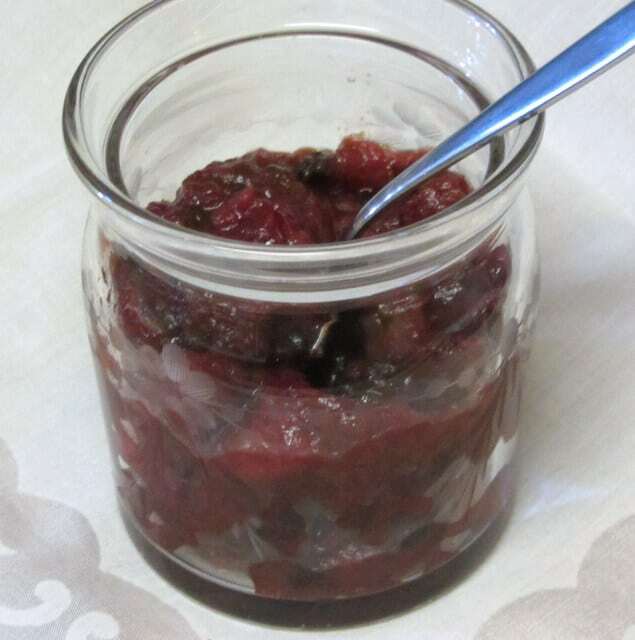 (I decided I’d rather just use vanilla with the blueberries I’ll be eating with this – the next batch will probably be ginger, to go with peaches.) It lends itself easily to variation. I started with 10 cups of rolled oats. 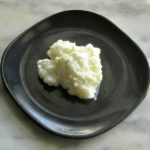 You can certainly make a smaller batch, but this fits in a container I have, and I don’t want to fuss with it often. I took a cup of raw almonds, and whirred them in the food processor until they were roughly chopped, then did the same with half a cup of raw sunflower seeds. (Though I might put them in whole, if I wasn’t already using the processor.) I mixed the nuts and seeds thoroughly with the oats in a very large bowl. I took a cup of natural peanut butter. It does have to be the natural kind, with just peanuts and perhaps a touch of salt – no hydrogenated oils or anything. I put it in a small saucepan with half a cup of water, and heated it gently, stirring. As it smoothed out, I gradually added another cup of water, and stirred it in, until I had a smooth, thick sauce. I added the vanilla to this, too. 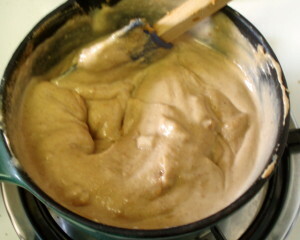 Then I poured some of the peanut sauce over the oat mixture and mixed it in. Kept doing so, mixing it thoroughly with the silicone spatula. Once it was all in, I used my fingers to break up the biggest lumps, and make sure the peanut mixture was well distributed. I do specifically want some clumping, but in smallish, spoon sized pieces. I also don’t mind having some oats and nuts not covered – but not much. I spread the mixture out in two pans. In this case, I used one half sheet pan and one smaller baking pan, because that’s what I have… Two half sheet pans would really have been ideal. Use whatever you have, as long as you an spread it out pretty flat. I used to do it in a big turkey roaster (and I’d mix it in that, too) but it would end up deep enough that I had to pull it all out of the oven and stir more often, and the whole thing took longer. Once it was spread out, I put it into a preheated 325 oven. I’m really drying it out, and toasting it lightly, more than baking. At a higher temperature I get a browner color – but I also have a greater risk of burning. 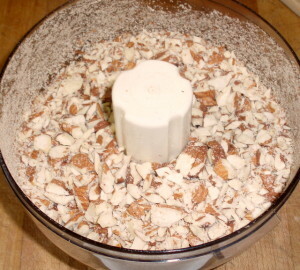 Another time, I might use walnuts and cinnamon… or any other mix that appeals to me at the time. I suspect that almond butter would work, if you have peanut issues – but we don’t, and I haven’t tried it. If you do, please let me know! In general, though, I have found it to be quite versatile – flavor it to your own taste! Making delicious homemade unsweetened granola is easy and doesn't take much time - I can save money and know what I am eating! 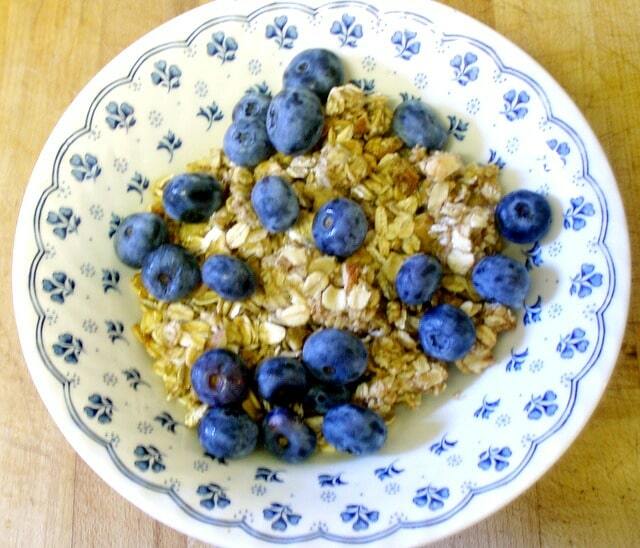 Mix oats, nuts and seeds in a large bowl. In a small saucepan, gently heat the peanut butter and half a cup of water, stirring carefully. As they blend, gradually add the rest of the water until you have a smooth sauce. (Do not bring to a boil - the goal is to mix them, not to make it hot.) Add the vanilla. Pour the peanut sauce over the dry ingredients, a little at a time, and mix in, letting small clumps of oats form. Spread the mixture out on baking pans. Bake at 325 for half an hour. Stir. Bake another 15 minutes, stir again and see if it is done - if still damp, give it another 10 minutes. Let cool, then store in a sealed container. Could you freeze this? How long can you keep it in the container? Hmm... I never really thought about that. I'm sure you could, but I don't think you'd need to, unless you are keeping it unusually long. I haven't tried it, myself. 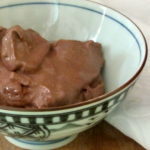 One recipe lasts me a couple of weeks, in my hot kitchen (and I usually make it in summer - I eat hot cereal in winter.) There is nothing in it that would go bad, until you reached the point of concern about the nuts and oils going rancid - I have never reached that point yet. Thinking - sealed well, it would certainly keep, but I'm not sure if freezing would affect the texture - it might lose a little crunchiness. Which might or might not matter to you... Thank you for asking! And if you do try freezing it, I'd love to hear how it works out! Thanks for blogging on this I have a local baker who makes this but it's expensive so I wanted to make my own. Do you use "instant" rolled oats or some regular rolled oats (or are those the same)? You're welcome, and thank you! OK - rolled oats. The difference is how thin the pieces are, which affects how quickly they cook, and how chewy they are. Instant (usually in my experience sold in little packets for way too much money) are the thinnest, Regular are a bit thicker and Old Fashioned are the thickest. I use Regular for this - Old Fashioned gets a bit chewy for my taste (though some like it, and if you have that it can be used.) I think Instant might be a bit fragile, but honestly I never used it in this. I could see using it if you had a bit of trouble chewing, though in that case I'd probably skip the granola and just cook my oats... Might be nice for variety, though. I hope you enjoy it! I made this last night and am so pleased with it I like corn flakes and fresh strawberries at this time of year but think corn flakes aren't the best choice I dislike sweetened cereals so was trying for an alternative that wouldn't conflict with the berries This is perfect! No overwhelming taste of peanuts, tho I think next time I will use almond butter as that might be more neutral. It fits the bill perfectly. I will give some to my sisters to see if they concur! Wonderful! Thank you for letting me know! I'd love to hear how the almond butter turns out. PB is what I tend to have around, but options are always good... And I agree about letting the flavor of the fruit come through! You're welcome! I had to make this from self defense, so I knew others would want it - and I seem to have been quite correct! The problem with granola is that the syrup creates the crunchy texture, so it's not just about the sweetness (though one does not need as much honey for that as I see in most of those recipes... LOL) Tahini. Fascinating. I don't, offhand, see any reason it wouldn't work - which of course is not the same as knowing that it does... I have not tested it. If you try it, I would love to hear about it! It sounds delicious, and a lovely variant. And yes, fruit contains sugar also, but... a small amount of juice in the larger amount of cereal is not generally going to be an issue. Just as I usually do, in fact, add fresh fruit when I eat it. I use some juice instead of sugar in some recipes, because it balances out in the whole recipe. Enjoy it! Thank you! Enjoy it! Well... there are a few nutritional calculators out there USDA's Supertracker, for one... and a lot of programs like Fitday and Sparkpeople have them. I'm not really familiar with any specific one now, so have no particular recommendation. Good luck! What a hearty, delicious way to start the morning! Love all those fresh berries on top too :) YUM! Look great and just in time for back to school send the kids off with energy for their day! Homemade granola is so fun to make and allows you to feel so much better about sweet breakfasts! 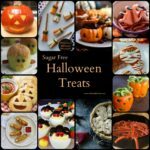 Love this recipe and the step by step instructions are always helpful! Love the simplicity of this recipe. It's easy, to the point with no artificial sweetening agents. Thanks for sharing !! This is such a terrific post! I love how you walked us through why you don't like store-bought granola (yeah ... allllll that sugar! ), and various things you've tried over the years to come up with this terrific recipe. Really interesting and so helpful! Thank you! 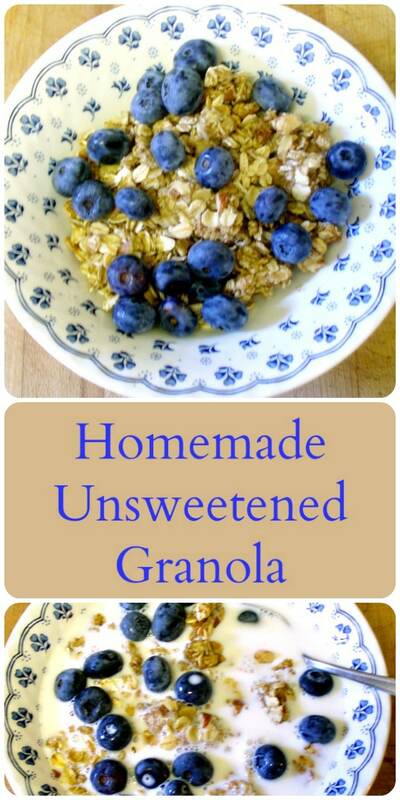 I have never actually made unsweetened granola, but I like the sound of it! 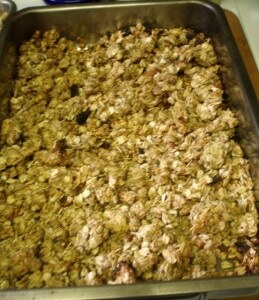 I can't really tell, how clumpy is this granola? Could I make it with large clumps. I also love my oatmeal in the morning. Although these days it's been a lot of the instant variety. Granola is a breakfast favorite of mine as well. Especially over yogurt. I love the idea of your unsweetened kind as I really don't crave a lot of sweets. Really like your version of granola, and the fact it's unsweetened! Looks so healthy and so tasty! Looks delish! Love a less sweet way to start the day. This is a great find for me. 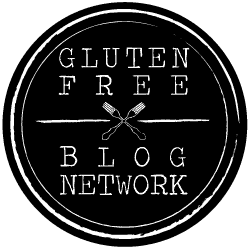 I have been looking for a granola recipe that has no added sugar. I love that you use peanut butter as the binder. We LOVE peanut butter. This granola sounds so tasty! And without the sugar? Yes please! With the peanut butter and almonds, there's obviously plenty of flavor without adding sugar! Our family loves to go on long road trips and snacks we can travel with are a must. We plan on heading to San Antonio next month and this is at the top of my list to bring! O only eat granola over Greek yogurt and thus would be perfect! Unsweetened and with peanut butter which I love! 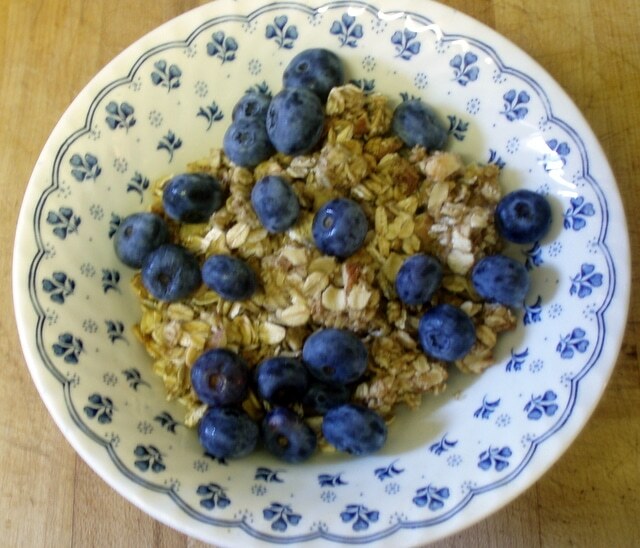 Making homemade granola has always been a hit or miss with me. Thank you for providing this recipe. Maybe I'll finally learn how to make good granola.